With daDup you get you own private Amazon S3 compatible storage. It is stored in our datacenters in the Netherlands (Ede) on our Ceph cluster for € 0,012 per Gbyte. What should I use daDup for? daDup is meant to store data off-site in a safe datacenter in Europe for backup or regular access. Synchronize all your data from NAS, server, PC or storage solution to daDup so you always have a copy of your data. How can I use daDup? Most software and appliances are able to communicate with Amazon S3 compatible storage services like daDup. Fill out the server name, credentials and bucket name and you are ready to start syncing. The "how to" of your favourite software or appliance might be on this page. And if it is not, you will get the idea. Configuring daDup to synchronize your data is easy. No limit is defined in daDup. If you put more data in your account, we will make sure we have the room for it. After the first 500 Gbyte you will be charged per Gbyte we store for you. Do I get informed when my storage grows? No. Since there is no limit defined, you have to check your software if you want to know how much storage is in use. We support our customers in English and Dutch. Support during office hours is free. It is impossible for us to know every setting in every client there is for S3 but we will try to help. We will bill you at the beginning of every new month for the amount of storage and traffic you used the last month if applicable. The payment term is 21 days. You can pay by self-transfer and direct debit. Mail to info@tuxis.nl that the account can be deleted at the end of the next month. Clearly state the name of the account and you customer number in that e-mail. 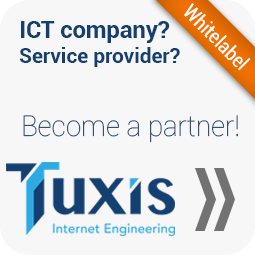 The terms and conditions from Tuxis Internet Engineering apply. You can read them here.